SALISBURY — Rowan County Crosby Scholars will enter the 2018-19 school year under new leadership. Jessica Vess, 39, will succeed Jennifer Canipe as the nonprofit agency’s new captain. Canipe announced her retirement in May, and Vess, a former Crosby Scholars employee, was asked to step in as interim executive director. Canipe encouraged Vess to put her name in the pot for the permanent job. “’If there’s anything in you that wants this job, you need to apply for it,’” Vess said Canipe told her. Vess said she was “humbled and flattered” to be chosen. Vess describes herself as “an East Coast girl,” as her family moved frequently when she was young. Around the time Vess started middle school, her family settled in the Chapel Hill area and chose to call it home. Though she has an eclectic background that includes business, college admissions, youth ministry and music, Vess said her passion has always been college access and helping young people figure out their goals in life. Vess earned her degree in business administration in 2000 from Chowan University and immediately accepted a job in the school’s admissions office. She married her husband, Jeremy, in 2002, and the couple moved to Nashville, then to Salisbury to be near Jeremy’s family. Vess dabbled in music, worship ministry and youth ministry before accepting a job at Crosby Scholars in 2013. Despite her other jobs, Vess said her passion has always beenl college access. But at the time, there were no local positions open. “I wanted to find that avenue, but (Salisbury) hadn’t really presented it to me,” she said. When Crosby Scholars was launched in 2013, Vess came on board as a program associate. It was Crosby Scholars’ first year, and the program were still fluid. But Vess said she’s been proud to watch it grow. “It’s really neat to have been involved in this program from its infancy,” she said. Vess held several jobs at Crosby Scholars before leaving to be a full-time mom to her newborn daughter, Josie, in 2016. But her stint ended on a high note, with her overseeing the program’s first crop of seniors — the same students Vess had worked with throughout their high school careers. “To really be with them the whole way was a really neat experience,” she said. Even juggling motherhood and worship ministry, Vess still volunteered with Crosby Scholars. She ran training, helped with the website and social media, and offered her expertise whenever asked. “I still had my hands in that work,” she said. When Canipe called and asked if Vess would serve as interim executive director, she agreed. “Jennifer contacted me and asked if I would help in this transition period,” Vess said. Now, Vess is excited to take Rowan County Crosby Scholars into the future — but she knows Canipe’s departure has left a void in the organization. A change in leadership won’t result in any hard and fast changes in the organization, Vess said. Crosby Scholars is modeled after a program in Forsyth County, a model Vess plans to uphold. But there are small ways to innovate, she said. The Crosby Scholars staff is constantly searching for new ways to reach more students and to help students meet their goals, she said. “There’s always new ways to go about trying to meet those goals,” she said. Vess hopes to cultivate deeper relationships with the school system — particularly with the guidance and career and technical education departments. “Those are some things I’d love to see our program tackle in the future,” she said. In the meantime, Vess and others at Crosby Scholars will continue to get the word out about the program. “We’re always educating the county on who we are, what we do and how we can help,” she said. While she has not concrete vision for the program, Vess does have dreams. 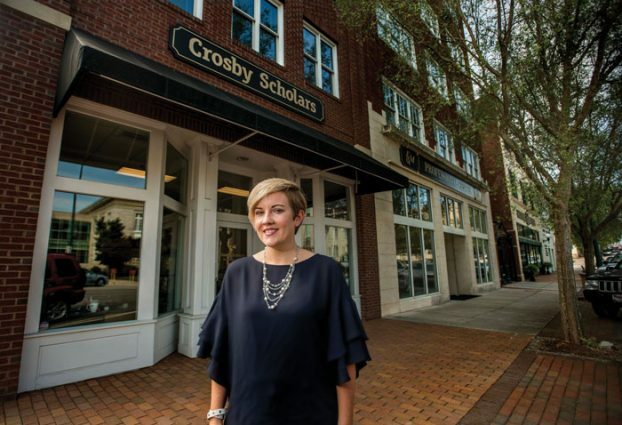 Her biggest one, she said, is that every Rowan County student would consider Crosby Scholars a resource at their disposal and that the program would “bring hope and a future” to any student considering college or their future — in any form.